I recently received the much anticipated Violet Vox Box from Influenster. Inspired by this season's dark, moody florals, the Violet VoxBox is for the beauty queens of Influenster Nation. Influenster is a hub where members meet to learn about new products from our favorite brands as well as review the products they already use in their day-to-day lives! Influenster invites its most active members to participate in exclusive VoxBox programs where members receive complimentary products to test and review. In exchange, they ask their members to do what they already love to do: share their opinions with their friends & followers on social media! 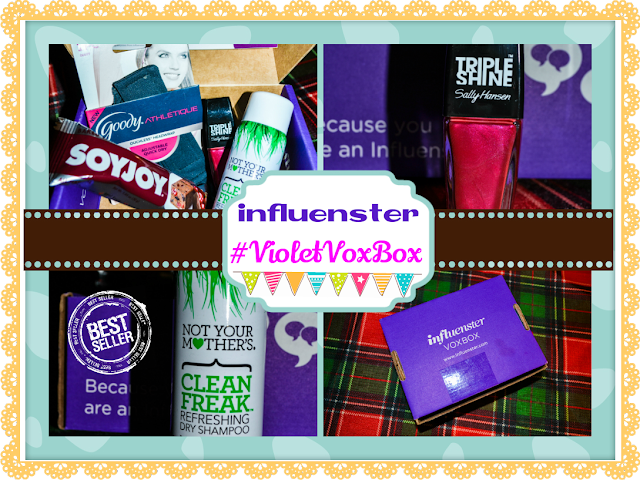 This time my #VioletVoxBox was filled with amazing products. My favorite product was the "Not Your Mother's Clean Freak Refreshing Dry Shampoo". I love dry shampoos so I was very excited to try this one out. 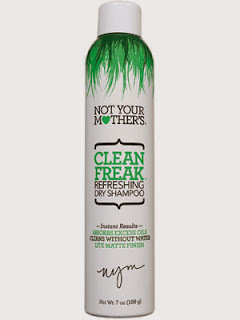 This shampoo absorbs excess oils, cleans without water and has a light matte finish. Spray generously on roots and throughout hair. Brush through to diffuse powder and watch it absorb any excess oils. Style as desired and enjoy your newly freshened hair. *Goody Athletique Reversible Quick Dry Headband- Great hair accessory that provides hold and comfort so you can be physically active and strong in body and mind. You can customize your headband's fit through its velcro adjustable strap. *Sally Hansen Triple Shine Polish - Get ready for the shiniest nails ever! Gloss is protected with the ultimate shield and complete daily defense from water and wear. *Soy Joy Bar in Dark Chocolate Cherry - Whole soy plays host to dark chocolate and real cherries in this dessert lover's delight. This is a gluten free product so it's great for those who with gluten intolerance or celiac disease? 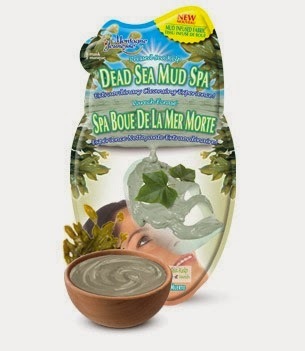 *Montagne Jennesse Dead Sea Mud Spa Mask - An extraordinary cleansing experience featuring the benefits of Dead Sea Mud, Dead Sea Salt, seaweed and kelp in a formulation infused into bamboo fabric masks. This allows optimal absorption and maximum cleansing while featuring 99% natural ingredients. Did you receive an Influenster Violet Box? Have you tried any of these products? Influenster in a free program but you need an invitation to join. Let me know if you need one. I'm not sure if I have any more left but if I do I'll gladly send you one.